Termites can easily hide while eating the foundation of your home. By the time damage is done, termite problems can cost you thousands of dollars. 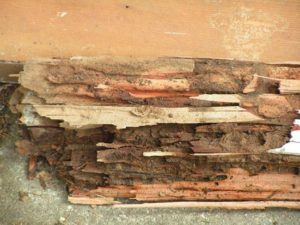 Because the majority of termite infestations occur at or near ground level, our inspector pays close attention to wood in basements and crawl spaces, window sills and frames, support posts, sub floors, supporting piers, joists, and wooden decks or porches, areas where concrete elements meet wood (steps, slabs, or porches, cracks in brick construction, expansion joints, or cement where termites attempt to gain entry), and wood piles and debris near the foundation including tree stumps, exterior basement window and door frames, and fence posts. We inspect the interior and exterior of the home for evidence of wood-destroying insects and wood-destroying organisms and provide you with a detailed termite inspection report. If there is evidence of termites, we provide you with specific recommendations and next steps.